Gustave Caillebotte, Young Man at his Window, 1876. You’re probably thinking, “Wow, this is the first seemingly normal painting she’s picked.” And yes, depending on your standards of “normal” art, it seems pretty simple. It’s an impressionistic (but fundamentally realist) portrait of a man looking, perhaps contemplating, out his window. But of course, there’s something about this painting that comes across to me as dark and cold, and I’m engrossed. My magnetism to moods of darkness in art has probably been amplified with my recent reading of Dante’s “The Divine Comedy.” Seeing as the epic poem is about the demonic layers of purgatory, there’s still something symbolic and relatable to my, much less sinister, life. I love thinking that my dull life could have some deep, ominous second meaning. This painting speaks to me in the same way as Dante’s work. As the man is gazing out into the stunning streets of Paris there is something unsettling in the cold colors of the buildings and sky that contrasts eerily against the man’s jet black suit. The unique perspective, that Caillebotte is known for, also lures me even more to the painting. 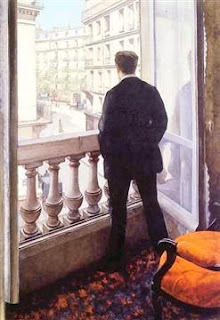 The position of the man in the open balcony acts as an invitation for the viewer to join him out on the balcony, even though his stance is quite astute. You can’t forget to notice the wall between the man and Paris which could mean countless things. The rail and glass could allegorically be people, the world or a mental barrier that is blocking him from something. And I think we could all relate to that feeling. All of these aspects contributed to Caillebotte’s lack of appreciation from the people of his century. As with most impressionists, his work was looked at as strange in his lifetime. Yet, his work was finally recognized for its unique perspectives and techniques in the 21st century when these impressionists artists were reviewed with more artistically open eyes, thankfully for us. you are a very good writer. descriptive and informative. it's interesting just looking at a painting or any form of art really and not thinking too much of it apart from like or dislike. you take it to a more appreciative level. and make your readers look past the canvas to meaning and feeling. it's like looking at something through another (yours) persons eyes! well done!